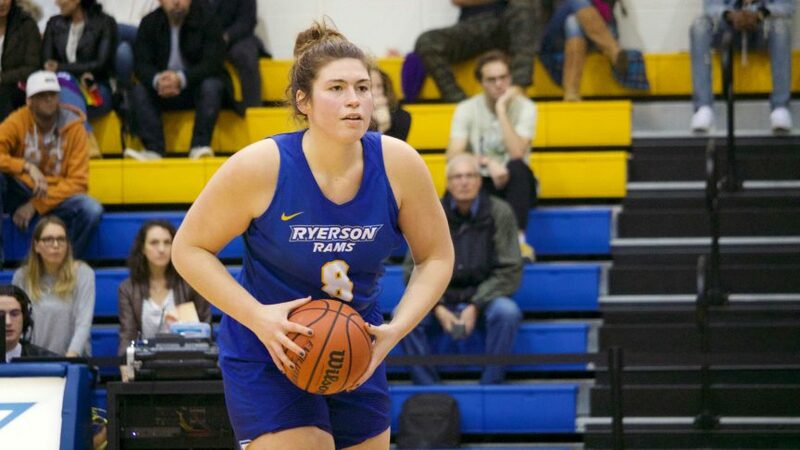 The Ryerson Rams women’s basketball team found success through their defence, taking a 53-42 win over the Toronto Varsity Blues at the Goldring Centre on Feb. 1. Toronto had no answers for Rams forward Sofia Paska, who led the way with a double-double, racking up 16 points and 13 rebounds. With the victory, the Rams sweep their two-game season series with their inner-city rivals. Ryerson also snapped a two-game skid, improving to a record of 15-4. A slow night offensively forced the Rams to dig deep on the other end, as they generated 14 turnovers and held the Varsity Blues to 27 per cent shooting. Paska lived inside the paint, collecting six offensive rebounds, while taking down every defensive look thrown her way. Rams guard Marin Scotten also had an impressive showing on both ends, adding 14 points and two steals. The guard led Ryerson’s offensive attack in the second half, scoring 10 of her 14 in the final two quarters. After a back and forth first 20 minutes, which saw Ryerson struggle to gain any footing, the Rams locked down in the third. Full court pressure and a stout zone defence rattled the Varsity Blues, leading to six turnovers and eight points for the road team. Rams guard Hayley Robertson struggled from the field, shooting 2-13 from the field, but she came up huge in the third with three steals to spark her team’s defence as the game went on. The fourth and final frame saw Ryerson lose steam, as Toronto made a quick push of their own. Unfortunately, it would be too late, as the Rams would hang on for the eventual nine-point win. UP NEXT: The Rams will travel to North Bay, Ont. to take on the Nipissing Lakers at the Robert J. Surtees Student Athletic Centre on Feb. 8. Tip-off is scheduled for 6 p.m.